May 31, 2013 Doug M. & Friends Greg, Jeff(Mr Freeze) & Paul. Also Now Known on Lake Calcasieu as THE Manvel “Bite Me” Fishing Team, Catch a Nice Mess of Big Lake Finest!!! May 31, 2013 Doug M. & Friends Greg, Jeff(Mr Freeze) & Paul . Also Now Known on Lake Calcasieu as THE Manvel “Bite Me” Fishing Team, Catch a Nice Mess of Big Lakes Finest!! Not Rain nor Wind could stop these guys from catching a mess of Hackberry Halibut and Redfish!!! 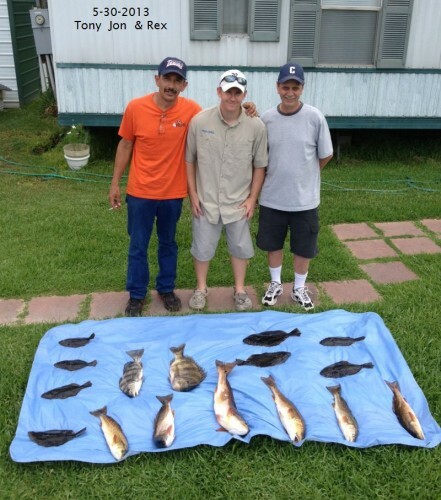 May 30, 2013 Jon, Rex, & Tony Catch Some Nice Ones In Gale force Winds on Lake Calcasieu!!! May 30, 2013 Jon, Rex, & Tony Catch Some Nice Ones In Gale force Winds on Lake Calcasieu!! We spent the day way back in the marsh with the Tide a foot above normal there is lots of water for the fish to hide. Live shrimp helped to put some nice Flounder and Reds in the box for a nice fish fry!!! 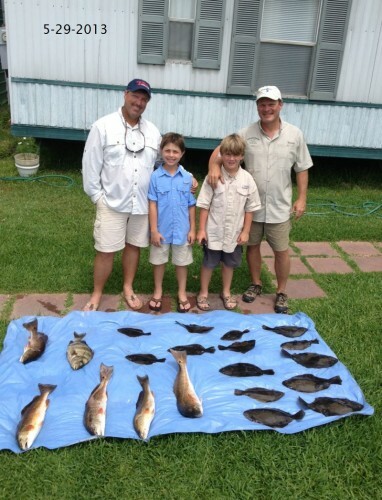 May 29, 2013 Great Father-Son Day on Lake Calcasieu for Barrett R., Preston, Matt & Noah !!! 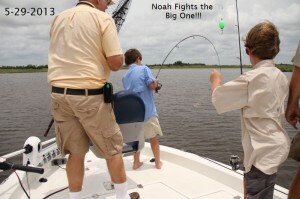 May 29, 2013 Great Father-Son Day on Lake Calcasieu for Barrett R., Preston, Matt & Noah !!! Noah was the Big fish catcher of the day with a 30 lb Black Drum.But even though the wind blew 20 to 25 all day it was a great family outing catching a nice mess of Hackberry Halibut and Reds!!! 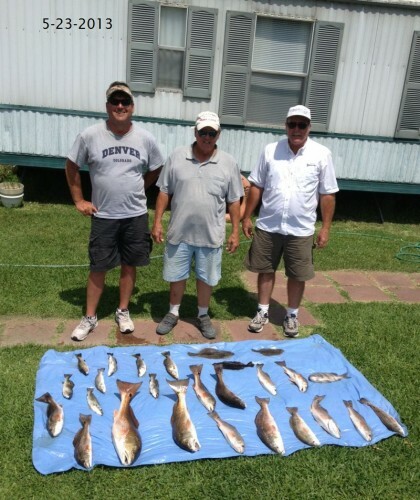 May 24, 2013 The Wind Didn’t Blow and the Fish were Hungry for Harry, Rob, Scott, & Scott on Lake Calcasieu!!! 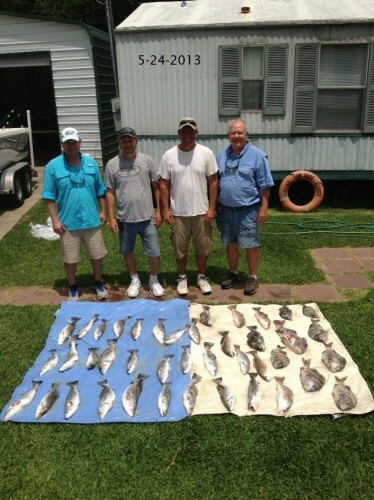 May 24, 2013 The Wind Didn’t Blow and the Fish were Hungry for Harry, Rob, Scott, & Scott on Lake Calcasieu!! These Guys put a nice mess of 2 to 3 lb Trout in the box with some reds , sheephead and Black drum for a great yearly outing to Big Lake!!! 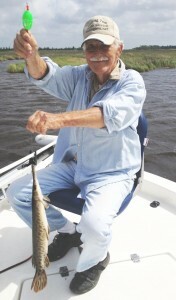 May 23rd, 2013 Rodney P. , Walter H. & Ross Make their yearly Trip To Lake Calcasieu and Catch a Nice Mess!!! 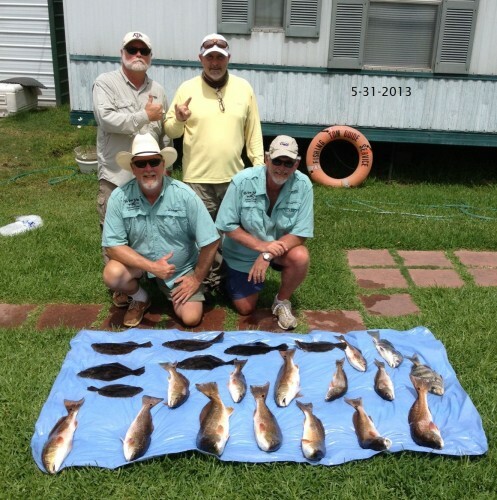 May 23rd, 2013 Rodney P. , Walter H. & Ross Make their yearly Trip To Lake Calcasieu and Catch a Nice Mess!! It was hard work and lots of looking to catch a Nice Mess of Big Lake Beauties!!! 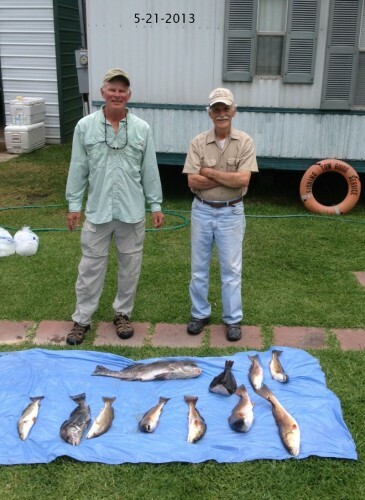 May 21, 2013 Uncle Hank & Son In Law Tracy Face Lake Calcasieu at it’s Worst(25 MPH Winds, Muddy Water & No Tide!) And Still Put some Nice Ones In The Box!!! May 21, 2013 Uncle Hank & Son In Law Tracy Face Lake Calcasieu at it’s Worst(25 MPH Winds, Muddy Water & No Tide!) And Still Put some Nice Ones In The Box . Including This Gar!! !